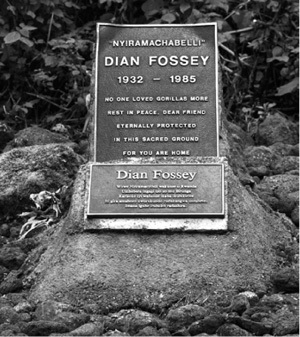 American zoologist Dian Fossey (1932–1985) was an occupational therapist who, inspired by the writings of the American naturalist George Schaller (1933–), decided to study the endangered mountain gorilla of Africa. She was trained in field work by Jane Goodall and went on to watch and record the behavior of mountain gorillas in Zaire and Rwanda. She eventually obtained a Ph.D. in zoology from Cambridge University and in 1983 published a book on her studies, Gorillas in the Mist. In 1985, she was found murdered in her cabin in Rwanda; her death is still unsolved. The movie based on Fossey’s work, Gorillas in the Mist, was released in 1988, with actress Sigourney Weaver playing the role of Dian Fossey. The movie was filmed in Rwanda and Kenya and galvanized support for the plight of the gorillas. American zoologist Dian Fossey worked to study and protect gorillas in Africa. She was murdered in 1985, and many theorize she died at the hands of poachers who felt she was interfering in their business.